Through a program called Design Ignites Change, Mark Randall and Worldstudio are inspiring a new generation of designers and architects to give back. This is the latest profile in Catchafire‘s Generosity Series, a multimonth celebration and investigation of bold generosity with the goal of understanding its causes, its benefits, and how to inspire more giving. We’ll be interviewing a long list of impressive change makers who have demonstrated their generosity through acts of service, rather than exclusively through deep-pocketed philanthropy. This month, we’re honoring the most generous designers. We’ve already looked at Social Media Mavens. The series will run through the winter with more profiles of generous Tech Founders, Wall Streeters, Marketing Gurus, and Filmmakers. Worldstudio is a New York City strategy and communications firm that builds bridges between clients and communities to enable positive social change. Mark Randall helped Worldstudio launch Design Ignites Change in collaboration with the Adobe Foundation to support architects and designers who want to make a difference in their communities. He is also the cofounder and chair of Impact! Design for Social Change, an annual six-week summer intensive at the School of Visual Arts in New York. How do you use design to turn your clients goals into social impact? The way I approach design is to start by looking for like-minded individuals to work with. The client base for our studio is nonprofit and civic organizations–who by their very nature are working towards positive social change. So, it is not so much about turning their goals into social impact, but working with them to enhance and strengthen their goals. Because of our socially minded work, our for-profit clients come to us because of our focus in this area, there is some aspect of the project at hand that has a social component, be it a CSR initiative or even a startup social enterprise. What is one of your favorite projects that Worldstudio has worked on? When we started Worldstudio in the mid-1990’s one of our first self-generated initiatives was a magazine we published called Sphere. The publication featured articles about artists and designers around the world who incorporated a social agenda into their work. When we launched in the fall of 1994, there was little to no coverage in the design or mainstream press about how artists and designers were tackling social issues. It was exciting to research and promote the work of these creative professionals. We had absolutely no money, so we developed a unique business model to partner with various corporations to produce each issue. This model allowed us to mail–for free–15,000 copies per issue to designers all across the country. Sphere was published roughly every 12 to 18 months until 2003. We hoped that the content was as inspirational to others as it was to us. This publication helped to shape the future of Worldstudio and it was one of the projects that gave us visibility in the design community. When it comes to client service work, often the project of the moment is my favorite provided that it has a positive social outcome and is developed with an active and engaged client. We have a roster of long-term clients, some of which we have been working with for almost 15 years. I am very much a believer in the concept of “the journey is the destination.” I get excited about the iterative process of design, developing a close working relationship with a client to help them realize their goals. How do Design Ignites Change and the Urban Forest Project work? What we can expect to see from them in the future? We created Design Ignites Change in 2009 in collaboration with the Adobe Foundation to support artists, architects, and designers who want to make a difference. Up until now, Design Ignites Change has been focused on the high school and college end of the spectrum; this year we are very excited to be expanding further into the professional realm in collaboration with AIGA, the professional association for design. Design Ignites Change operates in a number of ways: Scholarships and awards for college students. Fellowship programs for college students and creative professionals to help them incubate and launch projects for social change. Our signature workshop is a six-week summer intensive called Impact! Design for Social Change that we run with the School of Visual Arts in New York City. We are currently in the process of developing another week-long workshop which we plan to offer this summer. We also provide support in a more nuts-and-bolts way through our fiscal sponsorship program. This allows individuals and projects to operate under tax-exempt 501c3 status through our foundation without having to obtain it themselves. The Urban Forest Project was developed for the Times Square Alliance, a long-term client of ours. Times Square Alliance is the civic organization that manages Times Square–everything from the raucous celebration on New Year’s Eve to sanitation and security. 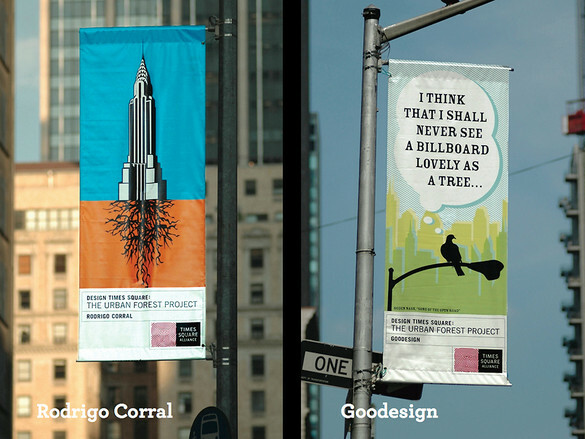 In 2006 they were in search of a public art project that would utilize the light-pole banners throughout the district. In partnership with the New York Chapter of AIGA we recruited 185 noted artists and designers from 21 countries around the world to create banners using the metaphor of a tree to make a visual statement. To us the tree is a symbol of sustainability, and in that spirit, once the banners came down, they were up-cycled into totebags by the designer Jack Spade. These totebags were sold to raise money for mentoring and scholarships for underserved kids in the arts. This was another expression of the idea of “sustainability”–sustaining the next generation of artistic talent. We imagined this project as a one-time event, but then we began to get unsolicited calls from cities all across the country interested in having the Urban Forest Project in their communities. These requests come mainly from urban foresters in search of a platform to engage their community in greening and forestry issues. To date we have done the program in eight cities. We continue to get requests; it’s not an easy project to implement and we have learned through trial and error the best way to do it. When did you realize your career as a designer would be focused on giving back? I formally realized this when David Sterling, the founder of Worldstudio, asked me to join him as his business partner back in 1993. David was interested in creating a studio that not only serviced clients but one that could develop and implement social projects. David retired from Worldstudio 10 years ago and I have been carrying the torch ever since. It is so embedded in what I do every day now I can’t imagine it any other way. When things get tough and I get frustrated with the design profession I fantasize about opening a bakery/ice cream shop–if I ever do I know it will also have some kind of social component. What is the name of one up and coming service designer we should be watching and why? Irina Lee, who developed First Person American (storytelling initiative that encourages immigrants to share their experiences of coming to the U.S.) as her thesis project while in the Designer as Entrepreneur MFA program at the School of Visual Arts. We supported her project in 2010 through our Design Ignites Change Fellowship Program, and since then she has continued to develop the program with some remarkable results–like filming a TV series and implementing a powerful, interactive workshop at the Newcomers High School (100% immigrant high school in Long Island City, New York). Irina’s design talent and dedication to the project have helped her secure additional funding from Sappi Ideas that Matter and an organization called Facing History and Ourselves. The next step is to expand First Person American to a national level. Who inspires you most with their generosity? My grandfather, Harold “Dutch” Rader, was a remarkable individual–a teacher and devoted supporter of the Worcester Academy, the school where he taught for most of his career. He worked in the alumni office helping to raise money and promote the school up until the day he died at 93. I remember him as always being generous of spirit; everyone loved him and he seemed to offer support of one kind or another just about everywhere he went. I like to think that true social change happens within each of us, with one individual helping another. It’s the ultimate in the bottom-up, grassroots approach. And it’s more of an attitude than anything else. How can one go through life and make a difference every day no matter how small?